Perhaps the most interesting concert of the Toronto Summer Music festival so far took place at Walter Hall last night. The main event was the presentation of Sounding Thunder; a work about the life of Francis Pegahmagabow, Canadian war hero and First Nations activist. Last night’s Decades series concert featured three works from the 1930s plus a sesqui. The sesqui, Andrew Balfour’s Kiwetin-acahkos; Fanfare for the Peoples of the North was definitely one of the more interesting of these short pieces. There were elements of minimalism combined with a nod to Cree/Métis fiddle music. Quite complex and enjoyable. It was followed by Barber’s rather bleak Adagio for Strings and the Bartók Music for Strings, Percussion and Celesta. It’s familiar enough fare and was well played by the orchestra under Peter Oundjian. I particularly enjoyed some of the weird percussion/celesta effects in the third movement of the Bartók. But really I was there for the second half of the program. I was back at the Four Seasons Centre last night for another look at Duke Bluebeard’s Castle or, perhaps more accurately, another listen. I really enjoyed the production again and I don’t have much to add to my earlier review. It was the music that had much more impact this time. I often find that with “modern” scores I get much more out of them on a second listening and that was true here. First time round I felt so battered by the loud bits, especially the section where the fifth door (Bluebeard’s empire) is opened with it’s extra brass and JohnWilliams on acid crescendos, that my brain somewhat discounted the quieter bits. Last night I was struck mainly by the meditative nature of much of the music. The influence of Débussy, especially Pelléas et Mélisande, seems clear. The little repeating figures for the woodwinds; there’s one that’s usually given (I think) to the flutes and or oboes) and another descending figure in the bassoons, are quite haunting. It’s really quite lovely when it’s not being brutal. 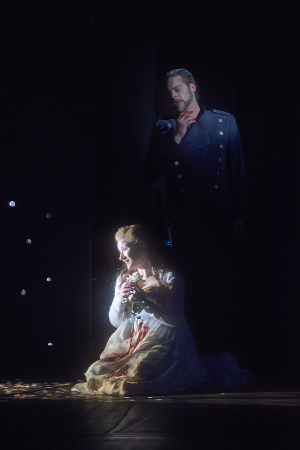 I also appreciated the relationship between Bluebeard and Judith more. This isn’t Perreault’s tale of a brute and an innocent. Gubanova’s rather fierce Judith is running the show. Maybe there is an element of hubris in this Judith. Relyea’s Duke by contrast is almost an observer and commentator; acquiescing in what must be. Some of this, of course, is in the libretto. Bluebeard isn’t killed and Judith shares the fate, whatever it is, of the other wives. But here she seems to do so willingly. I’m glad I saw this again. 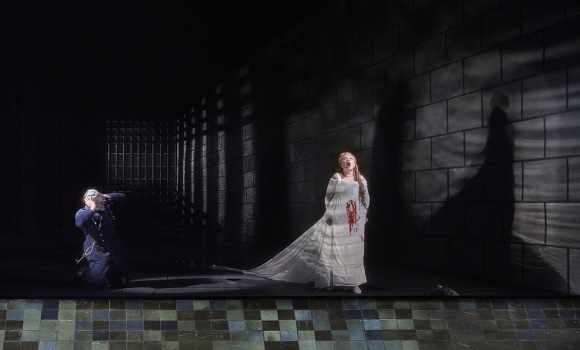 Robert Lepage’s 1993 double bill production of Bartok’s Duke Bluebeard’s Castle and Schoenberg’s Erwartung was the iconic director’s first foray into opera and it has been argued tht it put the COC “on the map” as a serious international opera company. It was revived last night with François Racine directing. Yesterday’s Amici Ensemble concert featured four works transcribed for different combinations of instruments than the composer originally intended. First up was Berg’s Adagio for violin, clarinet and piano. This is from the Kammerkonzert originally scored for violin, piano and thirteen assorted wind instruments. Unsurprisingly it doesn’t get played often in that arrangement. It’s pretty typical second Vienna school; twelve tone but quite accessible and very pleasant to listen to. It was expertly played by Serouj Kradjian (piano), David Hetherington (cello) and Joaquin Valdepeñas (clarinet).